Values are culturally specific. This handbook explains select biblical social values in their Mediterranean cultural contexts. Some examples of values are altruism, freedom, family-centeredness, obedience, parenting, and power. Though the English words for the values described here would be familiar to readers (e.g., altruism) the meanings of such words differ between cultures. In the Mediterranean world, for instance, altruism is a duty incumbent upon anyone who has surplus. It is interpersonal and group specific. In the West, especially in the United States, altruism is impersonal and universally oriented generosity that operates in a highly organized context. This handbook not only presents the Mediterranean meanings of these value words but also contrasts those meanings with Western ones. ""An already useful resource is strengthened in this third edition. New entries (e.g., 'Collectivism'; 'Mouth-Ears') and an updated bibliography for many of the entries make the Handbook an up-to-date reference work. This book will be valuable for undergraduates, for seminarians and pastors, and for laypeople who seek to better understand the values of the ancient Mediterranean world embedded in the pages of the Bible, without which modern readers are sure to misunderstand the writings contained in it."" --Eric Stewart, Associate Professor of Religion, Augustana College (Illinois) ""This volume is a tested cultural and social-scientific resource without parallel. Here is a hugely informative and reliable guide to the motivating worldviews and values of the biblical authors and their communities; an ideal handbook for both the pulpit and the classroom; and an essential resource for preachers, scholars, and visitors to the biblical world."" 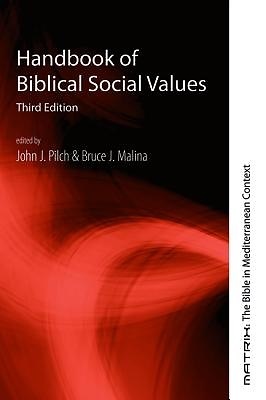 --John H. Elliott, Professor emeritus, University of San Francisco ""The Handbook of Biblical Social Values, 3rd Edition is a fitting tribute to John J. Pilch (1937-2016), a pioneer in social-scientific interpretations of the Bible. This updated and expanded edition is a must-have for any serious exegete of the Scriptures. It provides users with cross-cultural scripts for reading the Bible in its originating social contexts, provokes new and surprising understandings of seemingly familiar passages, and challenges the way we apply sacred texts today."" --Ritva H. Williams, Independent Scholar, St. Stephen's Lutheran Church, Cedar Rapids, IA John J. Pilch has been a visiting professor in the Odyssey Program at Johns Hopkins University since 2011. Previously he was professorial lecturer of biblical studies at Georgetown University. He is the author of many articles and books on the culture of the Bible, including The Cultural Dictionary of the Bible (1999), A Cultural Handbook to the Bible (2012), and The Cultural Life Setting of the Proverbs (2016). Bruce J. Malina is Professor Emeritus of New Testament at Creighton University. He is the author, coauthor, and editor of numerous influential books on the New Testament. These include The Social Gospel of Jesus (2001), The New Testament World (3rd ed., 2001), and Social-Science Models for Interpreting the Bible (edited with John J. Pilch, 2007).